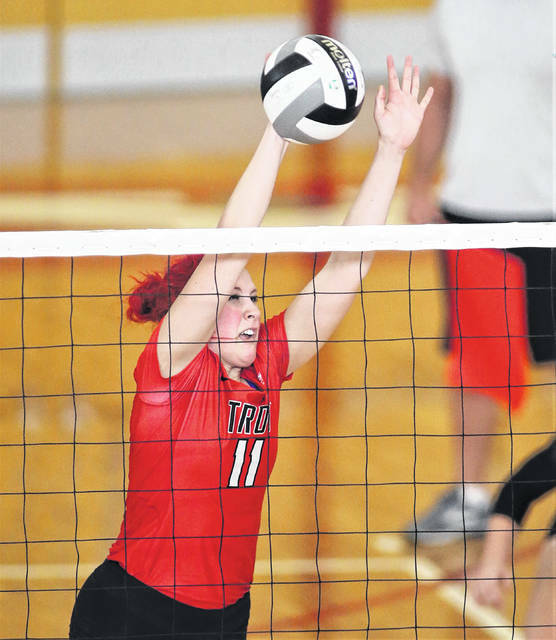 Lee Woolery|Troy Daily News Troy’s Alexa Holland passes the ball Saturday against Versailles. 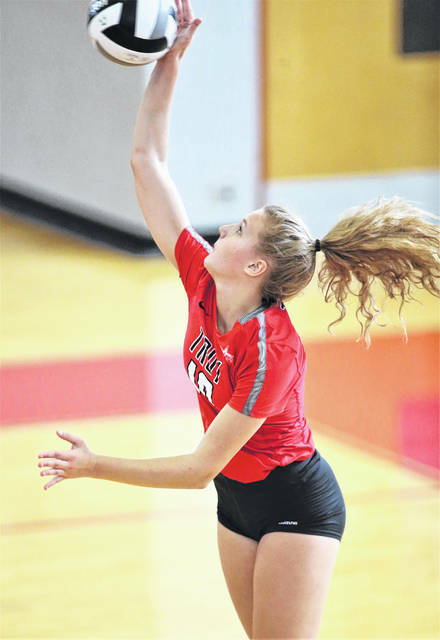 Lee Woolery|Troy Daily News Troy’s Payton Riley goes up for a kill Saturday against Versailles. Lee Woolery|Troy Daily News Troy’s Lauren Schmitz tips the ball over the net Saturday against Versailles. Lee Woolery|Troy Daily News Troy’s Morgan Baber sets the ball Saturday against Versailles. Lee Woolery|Troy Daily News Troy’s Brennah Hutchinson passes the ball Saturday against Versailles. 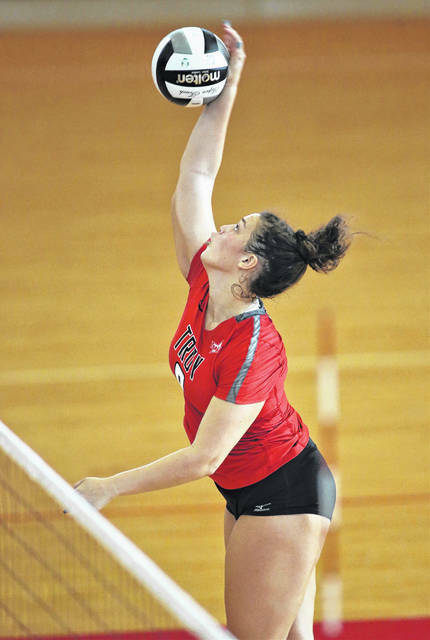 Lee Woolery|Troy Daily News Troy’s Brianna Slusher goes up for a kill Saturday against Versailles. Lee Woolery|Troy Daily News Troy’s Kate Orban tips the ball over the net Saturday against Versailles. Lee Woolery|Troy Daily News Troy’s Carly Pfeiffer goes up for a block Saturday against Versailles. 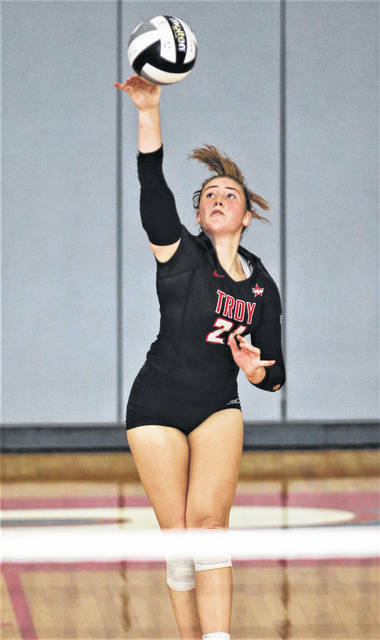 Lee Woolery|Troy Daily News Troy’s Emmie Jackson serves Saturday against Versailles. Lee Woolery|Troy Daily News Troy’s Ella Furlong makes a save Saturday against Versailles. 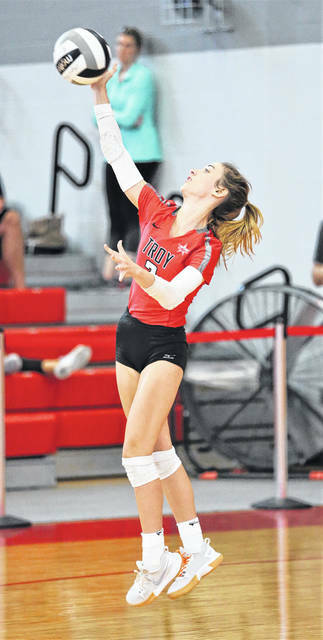 Lee Woolery|Troy Daily News Troy’s Alexa Holland serves Saturday against Versailles. 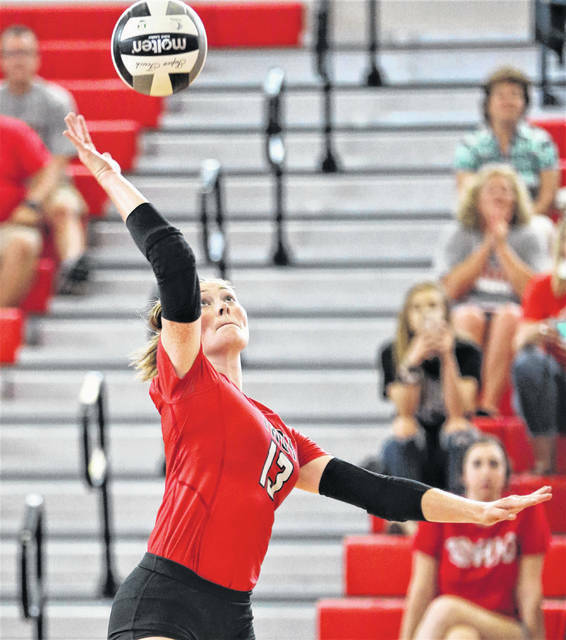 Lee Woolery|Troy Daily News Troy’s Lauren Schmitz goes up for a kill Saturday against Versailles. TROY — With her team one point away from losing in Game 5, Troy senior Payton Riley knew what she had to do. With the way things had been going for her lately, though, she didn’t know if she could. But in the biggest moment the Trojans have faced all season, Riley came through. Riley and fellow senior Alexa Holland led a Trojan service game that piled up a total of 30 aces against defending Division III state champion Versailles, with Riley ripping off three straight with the Tigers sitting on match point during the decisive fifth set to take the Troy volleyball team from one point away from losing to celebrating a 25-27, 25-12, 21-25, 25-12, 16-14 victory Saturday in front of a raucous crowd at the Trojans Activities Center. After a Lindsey Winner block gave Versailles two match points with a 14-12 lead in the fifth set, the Trojans ran a play to get Riley a shot at a tip, and she put it in the right spot to give the serve back to Troy — and herself. Her first serve was close enough to the back line for the Tigers to make a play on it, but they couldn’t control it and the score was tied 14-14 after the ace. Two more Riley aces later, and the Trojan celebration was on. Riley finished with five aces on the day, as well as eight kills, six digs and five blocks. A large reason Troy (9-3) was in position to win in Set 5, though, was the play of another senior leader in Holland. 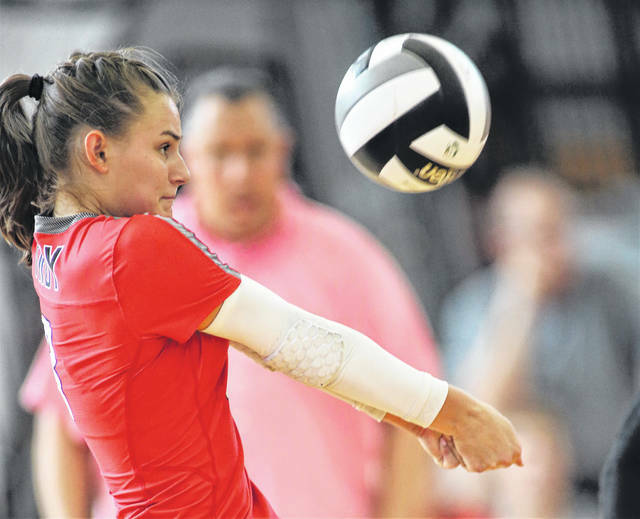 Holland, who had a team-high 16 digs, an assist and a kill, led the team in aces with nine on the day — and played through a lot of pain to do so. Troy actually had a shot to win Set 1, leading 24-22, but a kill and a block by Winner erased that chance. 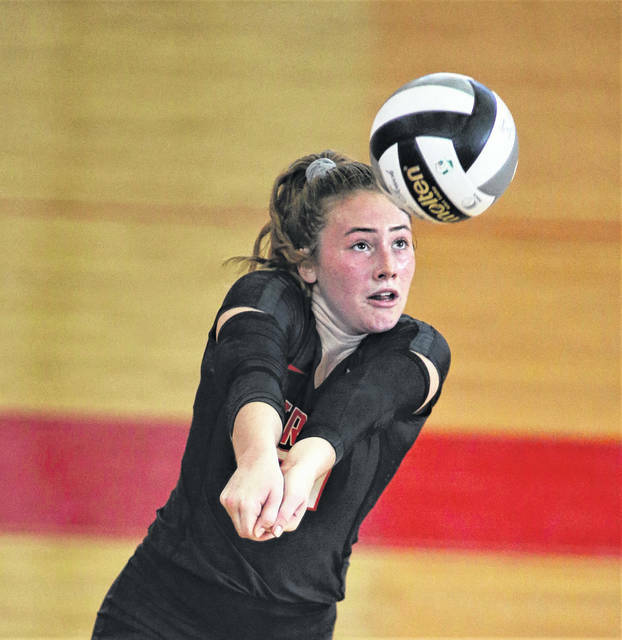 Morgan Baber tipped over a kill to give the Trojans another set point, but Winner and and Liz Ording put down back-to-back kills and a Troy error gave Versailles the set. In the second, Troy was in control from the start, with Schmitz serving six straight points with three aces and Brianna Slusher adding a five-point service run with two aces to even up the match. Holland kept Troy in the third set with her serving, piling up four aces during the team’s two longest runs, but the Tigers got an ace from libero Caitlin McEldowney to close out the set and retake a 2-1 lead. Troy cruised through Set 4 to even things up and force a fifth set, though, with Schmitz and Slusher combing for six kills and a Schmitz ace finishing it off. Holland served Troy out to a 5-3 lead with an ace that clipped the net chord early in the fifth, but a service error ended that run and Alexa Didier served Versailles to an 8-6 lead. An error and a three-point run by Schmitz gave the lead back to Troy briefly, but a series of Trojan errors and then a kill and block by Winner made the score 14-12 — setting up Holland for some redemption and ending with Riley’s match-sealing heroics. Slusher led the offense with a season-high 12 kills and added an assist, four aces, a dig and a block, and Schmitz added 10 kills, four assists, five aces, 10 digs and two blocks. Setter Morgan Baber had seven kills in addition to her 35 assists, three aces, 11 digs and two blocks, Kate Orban had four kills, three aces and four digs, Carly Pfeiffer had four kills, and three blocks, Gabbi Johnson had a kill and a block, Emmie Jackson had an ace and three digs, Ella Furlong had an assist and six digs and Brennah Hutchinson had three digs. It was only Troy’s second non-league win this season, with the other being a four-set win over Miami East. The Trojans lost in four at Centerville and were swept by both Fenwick and, most recently, Beavercreek in a rematch of last year’s sectional final. 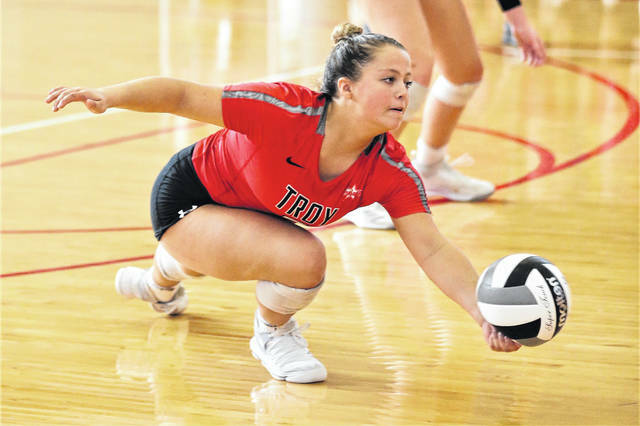 It was also Troy’s third consecutive five-set victory over Versailles — including a fifth-set rally from down 14-11 to winning 17-15 last season on the road. Troy travels to Trotwood Tuesday before returning home again to face West Carrollton Thursday. https://www.tdn-net.com/wp-content/uploads/sites/21/2018/09/web1_091518lw_troy_alexaholland2.jpgLee Woolery|Troy Daily News Troy’s Alexa Holland passes the ball Saturday against Versailles. https://www.tdn-net.com/wp-content/uploads/sites/21/2018/09/web1_091518lw_troy_paytonriley.jpgLee Woolery|Troy Daily News Troy’s Payton Riley goes up for a kill Saturday against Versailles. https://www.tdn-net.com/wp-content/uploads/sites/21/2018/09/web1_091518lw_troy_laurenschmitz.jpgLee Woolery|Troy Daily News Troy’s Lauren Schmitz tips the ball over the net Saturday against Versailles. https://www.tdn-net.com/wp-content/uploads/sites/21/2018/09/web1_091518lw_troy_morganbaber.jpgLee Woolery|Troy Daily News Troy’s Morgan Baber sets the ball Saturday against Versailles. https://www.tdn-net.com/wp-content/uploads/sites/21/2018/09/web1_091518lw_troy_brennahhutchinson.jpgLee Woolery|Troy Daily News Troy’s Brennah Hutchinson passes the ball Saturday against Versailles. https://www.tdn-net.com/wp-content/uploads/sites/21/2018/09/web1_091518lw_troy_briannaslusher.jpgLee Woolery|Troy Daily News Troy’s Brianna Slusher goes up for a kill Saturday against Versailles. https://www.tdn-net.com/wp-content/uploads/sites/21/2018/09/web1_091518lw_troy_kateorban.jpgLee Woolery|Troy Daily News Troy’s Kate Orban tips the ball over the net Saturday against Versailles. https://www.tdn-net.com/wp-content/uploads/sites/21/2018/09/web1_091518lw_troy_carlypfeiffer.jpgLee Woolery|Troy Daily News Troy’s Carly Pfeiffer goes up for a block Saturday against Versailles. https://www.tdn-net.com/wp-content/uploads/sites/21/2018/09/web1_091518lw_troy_emmiejackson.jpgLee Woolery|Troy Daily News Troy’s Emmie Jackson serves Saturday against Versailles. https://www.tdn-net.com/wp-content/uploads/sites/21/2018/09/web1_091518lw_troy_ellafurlong.jpgLee Woolery|Troy Daily News Troy’s Ella Furlong makes a save Saturday against Versailles. 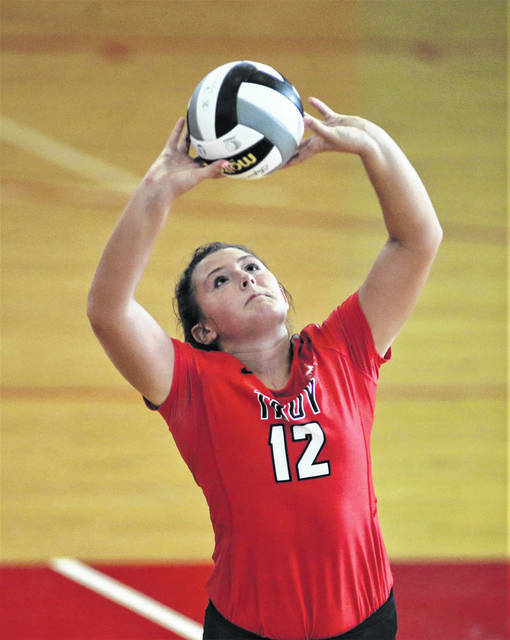 https://www.tdn-net.com/wp-content/uploads/sites/21/2018/09/web1_091518lw_troy_alexaholland.jpgLee Woolery|Troy Daily News Troy’s Alexa Holland serves Saturday against Versailles. 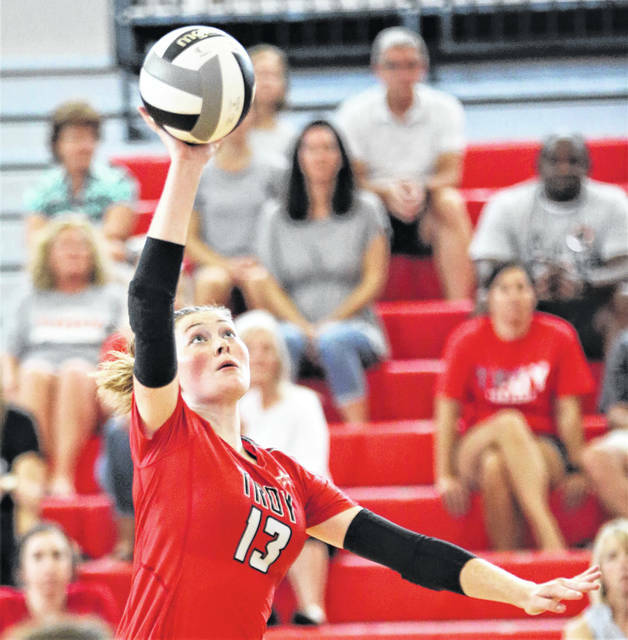 https://www.tdn-net.com/wp-content/uploads/sites/21/2018/09/web1_091518lw_troy_laurenschmitz2.jpgLee Woolery|Troy Daily News Troy’s Lauren Schmitz goes up for a kill Saturday against Versailles. https://www.tdn-net.com/wp-content/uploads/sites/21/2018/09/web1_091518lw_troy_paytonriley2.jpgLee Woolery|Troy Daily News Troy’s Payton Riley goes up for a kill Saturday against Versailles.